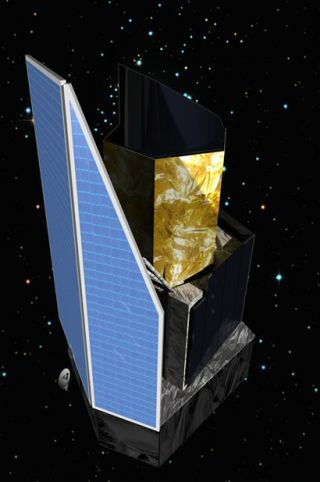 PARIS — European scientists on June 20 gave final approval to the construction of a billion-dollar space telescope to study the expansion of the universe, a project that has brought together some 1,000 scientists in Europe plus several dozen more expected from the United States. Meeting at the headquarters of the European Space Agency (ESA) here, Europe’s Science Program Committee (SPC) approved the construction of the Euclid satellite after spending eight months verifying its cost and feasibility. Euclid will employ a 3.9-foot (1.2-meter) diameter telescope and two cameras. A 576 million-megapixel camera in the visible wavelengths will observe about two billion galaxies with Hubble Space Telescope-level resolution, researchers said. A near-infrared camera, meanwhile, will chart the proximity and distribution of galaxies to get a fix on what is called cosmic acceleration. For reasons yet unknown, the universe’s expansion appears to be accelerating, and Euclid will attempt to find out what role mysterious dark energy — which is thought to make up the bulk of the universe but has never been directly observed — plays in this phenomenon. The 4,760-pound (2,160-kilogram) Euclid satellite is scheduled for launch in 2020 aboard a Europeanized version of Russia’s Soyuz-Fregat rocket operated from Europe’s Guiana Space Center on the northeast coast of South America. The scientific push on Euclid’s behalf was so great that ESA agreed to accept the mission even though its cost to ESA — 606 million euros ($788 million) in 2012 economic conditions — is far higher than the nominal budget of 475 million euros that ESA had set for so-called medium-class science missions. Just as much of a concern when the SPC adopted Euclid in October was whether key ESA member states — notably France, Britain and Italy — would be able to commit to providing the observing instruments and the various ground centers that Euclid will need. ESA has estimated that the instruments to be provided by national European agencies and laboratories are valued at around 150 million euros. A similar amount will be needed for Euclid’s elaborate ground network, including eight data centers distributed around Europe. Given these uncertainties — and to leave time to assure that Euclid’s design could be accommodated by a Soyuz rocket — the SPC gave itself until June to verify the mission. That waiting period pushed the scheduled launch from 2019 to 2020, but otherwise the project’s estimated cost has not changed in the past year, Rene Laureijs, ESA’s Euclid project scientist, said in a June 20 interview. ESA and NASA have agreed on a U.S. contribution that has been tentatively estimated at between $40 million and $50 million. The NASA participation will come in the form of Euclid’s infrared detectors. Laureijs said the memorandum of understanding has been agreed to by both agencies and is awaiting formal signature in the near future. In the months between the October decision and now, ESA program managers also evaluated the best way to assure a distribution of Euclid work. They agreed to separate the award of the Euclid payload from the selection of the prime contractor. Laueijs said the thinking was that awarding a single contract would inevitably lead to a concentration of the work at the prime contractor. Instead, he said, the agency will issue a request for bids for the payload in July, with a selection of a payload builder in November. Only then will a bid request to prospective prime contractors be issued, with a selection scheduled for May 2013. Laureijs said the ESA Euclid team looked closely at the possible cost consequences of forcing the prime contractor to adapt to an already selected payload rather than following the usual procedure of having the prime take responsibility for the entire structure. He said the conclusion was that it would not result in a substantial cost penalty.